It also came with two lexan subbases, one with a large opening (2.5”) attached to the fixed base, and one with a small opening (1.25”) attached to the plunge base. The sub base with the small opening has 4 screw-holes (at 90 degree increments), and the sub base with the large opening has 3 screw-holes (At 120 degree increments). The chamfer bit I have is too big for the small sub-base, so I set to moving the sub-base with the large hole to the plunge base. 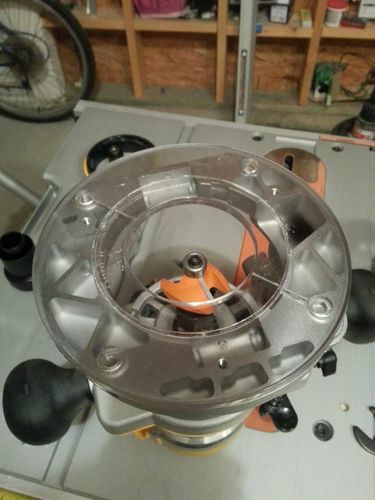 I then discover that the plunge router only has screw-holes that fit the sub-base with the small hole. See: sub-base with 4 screw holes, but plunge base with only 3. So I’m feeling a bit stuck. I can’t seem to find a dewalt sub-base that fits what I need. I’m using the plunge router because I don’t have a router table, and that seemed the best way to get a consistent chamfer across all the pieces I’m working on. Do I need to make my own, or find a generic one that will fit? Do I use it without a sub-base at all? I’d appreciate any recommendations – Thanks! 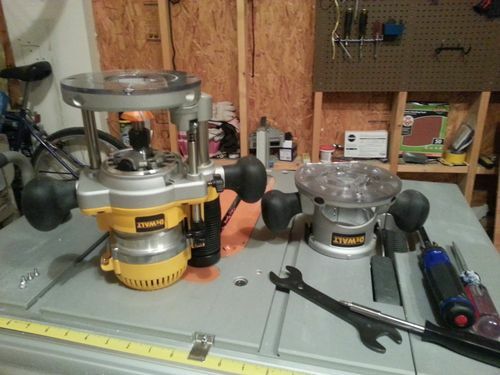 Why can’t you use the fixed base router? For a chamfer the fixed base should be fine, why would you need to plunge it? Crap, you guys are right. For some reason I had it in my head I wouldn’t be able to get the right length chamfer with the fixed base. Chris, just as a point of info. If you find you need to make a plate for something special, go to the “dollar store” and buy their cutting boards for a buck or so. You can make them anything you want cheap.